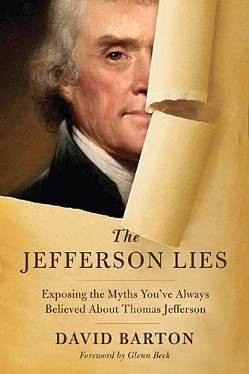 Note: On Aug. 9, 2012, the original publisher of The Jefferson Lies, Thomas Nelson, announced it would cease publication of the book following numerous complaints about its accuracy. If asked to identify the most influential writer on American history today, most people would name David McCullough (1776, John Adams), Doris Kearns Goodwin (Team of Rivals), or some other well-known historian. The name of David Barton would be unfamiliar to many, though he is not to most evangelicals and conservative politicians. Barton, who has been writing books about America’s Christian heritage for two decades, arguably deserves the above designation. With the publication of his new book, The Jefferson Lies: Exposing the Myths You’ve Always Believed about Thomas Jefferson, Barton seeks to break through to a wider audience with his account of the religious and moral life of the great Founder. In so doing, Barton hopes to expand his influence while securing the recognition as a legitimate historian that so far has eluded him. But his newest effort suffers from many of the same failures of his previous works, reinforcing widespread criticism that Barton distorts history in the service of an ideological argument rather than true scholarship. The basic theme of The Jefferson Lies is that modern Americans have formed an incorrect impression of Thomas Jefferson, one that has been perpetrated by liberal academics and the media. The prevailing view of Jefferson, according to Barton, is one of a conflicted and tragic hero: a political leader and philosopher of the Founding through his authorship of the Declaration of Independence, but also disreputable character who was a racist and an atheist. Jefferson fathered children by his slave mistress and embraced a radical form of Enlightenment secularism; he despised religion and sought to impose a strict separation of church and state. Barton seeks to correct this “standard” history and dispel such “lies” about one of the nation’s leading Founders. Rather than being a religious heretic and a racist libertine, the Jefferson who emerges in Barton’s account is religiously devout just short of being an evangelical Christian and an early advocate for the rights of African Americans. Jefferson “was pro-Christian and pro-Jesus in his beliefs, demeanor, and public endeavors.” This “Jefferson” did not intend to perpetrate a secular public square through the separation of church and state but to promote religion by protecting churches and people of faith from the overreaching of government. By Barton’s account, Jefferson would likely feel comfortable at a modern Tea-Party rally. To fully appreciate The Jefferson Lies, one must examine it on two levels: first, Barton’s background and previous writings; and second, the strength of his arguments in his new book. The Jefferson Lies cannot adequately be understood without an understanding of its author. Two decades ago, Barton was an obscure, self-trained “historian” writing books and pamphlets that promoted a Christian character of America’s Founders and the institutions they established. Initially, his audiences were small religious and political conservatives with little knowledge of American history but with a predisposition to believe that modern-day America had abandoned its earlier values and Christian character. Through perseverance and good timing, Barton slowly positioned himself at the forefront of a movement promoting a form of Christian nationalism a diffuse group of religious and political conservatives who seek to reclaim the nation’s purported Christian roots and reassert them in public policy. Today, Barton is no longer a lonely voice crying in the wilderness. Barton has built his small company, WallBuilders, based outside of Fort Worth, Texas, into an influential publishing and promotional empire. In addition to publishing books, WallBuilders now distributes videos, instructional guides and curriculum materials, and its staff conducts trainings and “spiritual heritage tours” of Washington, D.C., and other historical sites. The constant theme in all of Barton’s activities is that the nation’s founders were overwhelmingly Christian, if not evangelical, and that they intended the nation and its governing principles to be based on Christian values. Barton seeks to expose the modern-day sanitization of American history perpetrated by educators and historians and to reclaim the nation’s Godly heritage. Barton has emerged as a force among political and religious conservatives, with figures such as Newt Gingrich, Mike Huckabee and Michele Bachmann embracing his materials. (Barton served for several years as vice chair of the Texas Republican Party and is a regular speaker at Republican sponsored events attended by conservative evangelicals.) For more than a year, Barton was a regular guest on Glenn Beck’s Fox News show, promoting the religious bona fides of the Founding Fathers. Barton claims to speak to 400 groups per year and he served as a chief advisor to the Texas State Board of Education as it undertook revisions to the state’s social studies curriculum. Barton’s influence, and the historical account he advocates, has been extensive. Recently, Barton has received considerable attention from the mainstream media. Time magazine named Barton as one of the 25 most influential evangelicals in America today, while in May 2011 the New York Times wrote a sympathetic profile of Barton. This attention secured Barton a coveted appearance on The Daily Show the same month, where he gave evasive answers to Jon Stewart’s probing questions. Less flattering profiles have recently been published in The Atlantic and Mother Jones, among other magazines. Despite his new-found fame, professional historians, journalists and advocacy groups have scrutinized Barton and his works for many years. (The Texas Freedom Network has catalogued much of the scholarly criticism athttp://tfn.org/david-barton-watch/.) Observers have long criticized Barton for promoting a selective and sanitized view of American history. Critics have charged, and documented, that Barton regularly edits statements of historical figures or takes them out of context to support his own views. This latter approach, called “proof-texting,” involves selecting a favorable statement from a historical figure and then claiming it represents his comprehensive view on a subject. Beyond distorting Founders’ intentions, critics charge that Barton has also made up statements. (Barton claims to possess more than one thousand original documents from the founding period, many of which have not been seen by professional historians; some of the documents are available on WallBuilders’ web-page, but not all.) Mark Lilla, a professor of humanities at Columbia University, has derided this approach as “schlock history written by religious propagandists.” Significantly, criticisms have come not just from the secular left; mainstream evangelicals such as historian John Fea of Messiah College and filmmaker Chris Pinto have chastised Barton for his shaky historical method and transparent ideological agenda. One could argue that Barton does nothing different from professional historians. All historical works represent the authors’ perspectives, and all historians select and synthesize historical materials to support their various theses. Barton insists, however, that his works offer the unvarnished “well-researched truth.” He lets the historical documents speak for themselves to reveal the objective history, uncorrupted by time and interpretation. It is the professional historians who have misled Americans about their past those with “a PhD after [their] name[s]” who claim “academic infallibility” and engage in “academic collectivism” (Barton’s term) by relying on each other’s works instead of on original documents. Too be sure, all professional historians evaluate the veracity and relevance of any historical document and decide which passages to quote and which to disregard. And no historian can fully isolate herself from her own predilections and the present cultural milieu. Because of this tension, historians impose particular rules or guidelines on their scholarship, termed the “historical method.” As David Hackett Fischer wrote in Historians’ Fallacies, all valid historical questions must be open-ended, not preordaining any conclusion, and questions must be empirically verifiable. Historians must avoid the fallacies of false causations, reductionism and false analogies. And they must treat the historical record fairly. In essence, the mere fact a historical figure may have studied a particular philosopher, read a particular book, associated with particular individuals, or even made a particular statement cannot necessarily be seen to represent that figure’s views or to have motivated his actions. This is where Barton’s writing has fallen short. His earlier books (The Myth of Separation; Separation of Church & State: What the Founders Meant; America’s Godly Heritage; Original Intent) ask preordained questions, rely on data of questionable authenticity, and draw conclusions based on shaky causal connections. For good reason, Barton’s earlier works have been universally panned outside of conservative political and evangelical circles. This brings us to Barton’s The Jefferson Lies. In many respects The Jefferson Lies represents a departure from Barton’s earlier works. While its content is essentially a re-packaging of Barton’s same tired themes, what is immediately noticeable about the book is the absence of an overtly ideological argument. The prose is generally factual and descriptive. One can read extended passages from the book without encountering a pro-Christian nation argument. And Barton relies extensively on original documents and authentic compilations of letters, correspondence and memoirs for his sources (though Barton has long sought to impress and overwhelm readers and critics with extensive historical documentation). Unlike his other works, The Jefferson Lies has the appearance of a legitimate piece of historical writing. It is as if Barton has heard the cries of his critics about his weak analytical method. Most likely, Barton seeks to reach a mainstream audience with The Jefferson Lies unlike the audience of his earlier works one that lacks a predisposition toward a Christian nationalism perspective. Not only has Barton’s tone moderated, so too have some of his claims. Unlike his earlier works where Barton characterized separation of church and state as a false concept that has contributed to the nation’s moral decay, he now embraces a modified version of the concept, one that promotes religious values. It is as if Barton has realized that he can advance his perspective more effectively through stealth and subtlety, rather than through confrontational polemics. Barton has apparently decided no longer to preach to the choir but to go after those nominal adherents who would be put off by a more contestable work. As if to gain additional credibility for his project, The Jefferson Lies is published by a respected publisher (Thomas Nelson, Inc.), rather than by his own publisher, WallBuilders. Despite Barton’s best effort to write a mainstream history about Jefferson, he falls short. The Jefferson Lies suffers from many of the same methodological errors as his earlier works. The first, systemic error pervading the book concerns his choices of “lies” to be refuted. Most of the so-called distortions that Barton seeks to rectify are of his own imagining. Barton sets up straw men with exaggerated characterizations of the false claims, which he is then conveniently able to knock down: Jefferson was an atheist; Jefferson hated clergy and religion, particularly its public representations; Jefferson so despised the Bible that he wrote his own version; Jefferson founded a secular (read “anti-religious”) university; and Jefferson was a racist who fathered children with slaves. The problem with these claims, beyond their exaggerated quality, is that they generally have not been made by professional historians. No Jefferson scholar of repute has claimed that he was an atheist (this claim was made by his political opponents during the 1800 election, but no legitimate historian has accepted this political hyperbole as fact) and historians have long noted Jefferson’s deep interest in religious matters. Similarly, while DNA testing has established that possibly two of Sally Hemings’ children were fathered by members of the Jefferson clan, most historians concur that the actual paternity is unknown. This pattern of exaggerated claims, of both the meta and micro variety, continues throughout the book. But these errors are compounded by another Barton technique: of making false causative connections between facts. One example is found in the chapter on whether Jefferson founded a secular university (University of Virginia). Despite its title, the chapter is as much an examination of Jefferson’s philosophical inclinations (viz, was Jefferson an Enlightenment rationalist or a Christian?) and whether he intended for education to reflect one approach or the other. Through implication and innuendo, Barton argues Jefferson favored a distinctly Christian approach. Of significance for Barton, Jefferson was educated at an Anglican college (William & Mary) and studied Christian writers. Though Jefferson also studied Enlightenment writers, he favored the Christian-oriented ones (the distinction between Christian and secular Enlightenment theorists is clearly Barton’s own unable to get around the popularity of John Locke, Barton describes him as a “Christian theologian”). And Jefferson at times criticized David Hume and other secular theorists. Therefore, Jefferson must not have ascribed to secular Enlightenment theories and had not intended for his university to teach them. And Barton minimizes Jefferson’s decision to forbid a professorship of theology at the university a bold step for the time by noting that Jefferson invited various denominations to establish private professorships and chaplaincies and use the college’s facilities. This all convinces Barton that the University of Virginia was the nation’s first “transdenominational” Christian college. The problem with Barton’s argument beyond his selectivity of events he highlights is the causative assumptions he makes. He also fails to credit the significance of Jefferson’s venture for the time. As he acknowledges, up until that time, most higher education was controlled by denominations and existed for the purpose of educating clergy. Jefferson sought to break with that tradition by orienting his university in a non-religious direction with a curriculum that emphasized secular subjects and open speculation. Jefferson did not achieve all of his goals. Barton fails to mention that Jefferson finally relented to allowing private religious professorships on campus in order to gain political support. Jefferson fought to have known religious skeptics included within the faculty, again relenting in the face of opposition. So Barton is half true with his account of the facts, but his conclusions are lacking. This is not historical scholarship but counter-factual “history” based on innuendo and false causations. That other people held related beliefs that led them in particular directions tells us nothing about what Jefferson believed or how his beliefs may have evolved. But we need not speculate about Jefferson’s beliefs. He wrote extensively about his views on God, Jesus, Christianity and the Bible. He was a keen student of religion and was both a religious skeptic and believer in a god. Like many of the Founders, Jefferson adhered to a form of deism (deism was not a separate denomination but an orientation which insisted on a rational and non-interventionist deity). Many Founders viewed their deism as not inconsistent with a general belief in Christianity. But Jefferson’s specific beliefs a denial of Jesus’ divinity, the Trinity, the resurrection, punishments after death, and the reality of miracles put Jefferson on the extremes of his contemporaries. No respected scholar who has studied Jefferson’s faith Dumas Malone, Merrill D. Peterson, Edwin S. Gaustad, Charles B. Sanford draws the conclusions that Barton makes (but then, they are corrupted by their PhDs.) Jefferson was clearly not anti-religious, but efforts to turn him into a budding evangelical are laughable. The Jefferson Lies contains other mischaracterizations and false analogies. Barton disputes that Jefferson so hated the Bible (another manufactured “lie”) that he compiled his own version that omitted essential portions of the Scripture (the so-called “Jefferson Bible”). Barton claims that Jefferson collected multiple copies of the Bible and so revered its contents that he complied the moral teachings of Jesus into a book for his personal use and for distribution to the “Indians.” (Barton does not realize that this arguably was Jefferson’s code word for his Federalist and clerical adversaries.) This book, Jefferson’s Life and Morals of Jesus of Nazareth, Barton claims, contains numerous passages about the miraculous and supernatural, which is powerful evidence attesting to Jefferson’s faith. Barton is correct that some people have mischaracterized Jefferson’s “Bible” as indicating his disdain for Christianity generally. On the contrary, Jefferson’s Life and Morals reveals his desire to capture the essentials of Christian faith, uncorrupted by church doctrine and organized religion. But there is no denying that Jefferson removed many parts of the New Testament as the facsimile copy reveals, by using scissors that Christians of the day (and today) would consider fundamental and indispensable to Christian belief. Missing are references to Jesus’ divinity, miracles, the virgin birth, his substitutional atonement, and his resurrection and ascension into heaven (all central to the Christian message). Again, Barton relates only that half of the story that supports his conclusion that Jefferson was a devout Christian while ignoring those aspects of the Life and Morals that contradict the same. The final error that ties the other errors together involves Barton’s conclusions. Having “proven” that Jefferson was deeply religious, a “Christian Primitivist,” Barton makes the same leap as other advocates of Christian nationalism. If Jefferson and other Founders were Christian, they could not have established a government based on secular principles or supported the separation of church and state, at least as that concept has been interpreted in modern times. (Here, Barton again relates a handful of actions in Jefferson’s career that purportedly suggest he advocated the government’s patronage of Christianity.) But like so many Christian nationalists, Barton engages in the fallacies of false analogies and reductionism. He falsely assumes that a person of faith could not support a regime of secular governance, one that sees the dangers lurking in forms of church-state interdependence. He highlights “inconsistencies” while giving little account for the great body of Jefferson writings advocating for separation and religious liberty. And he fails to acknowledge the evolution of thought about church-state matters that transpired during the Founding period. The Jefferson who emerges is not the complex man who could promote liberty while holding slaves, or could advocate for secular government while holding his own heterodox theistic beliefs. Instead, to be an “American Hero” in Barton’s view, Jefferson must be reduced to a two-dimensional figure who can only be religious if he is a Christian according to Barton’s narrow definition. In the end, The Jefferson Lies is little more than the repackaging of Barton’s earlier works. It deserves the same unfavorable response that his other books have received. But this new packaging of old arguments may succeed where the other books have failed. With its moderated claims and restrained tone, The Jefferson Lies seeks to project an aura of legitimate scholarship. This may allow Barton to reach a wider audience that has so far eluded him.